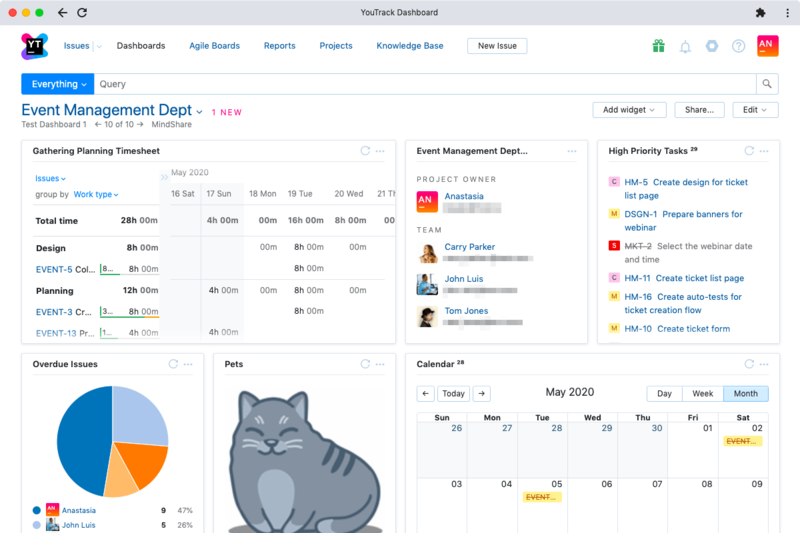 Stay on top of your project and team activities with the live Dashboard. Add widgets for reports, top issues, and quick notes. You can drag them anywhere on the Dashboard to organize everything just the way you want. Create multiple dashboards, share them with your team or any other users and groups. Manage sharing options to let users edit your board or use it in view-only mode. Multiple dashboards let you follow the progress for different projects on their own. The sharing option gives you a good idea of what’s important for your teammates or manager. Create a Guest Dashboard to share important information with your customers or external users. This feature is extremely useful for those who want to share the project’s activities with the customers. Just configure a Guest Dashboard and it will be shown to users externally. Configure your Dashboard to track your own, or your team progress, just the way you need it. Add your personal tasks and notes that will only be visible to you. Most of the widgets are automatically recalculated every 10 minutes, and some of the reports are updated according to the configuration settings. Want to share a widget with your team or your Manager? Simply get a link to your widget and share it with anyone who is interested. Clone a widget if you want to get a similar one. Open a widget in a full screen to get more details. Build your own widgets and add them to your dashboards! You can also access widgets built by other users in the JetBrains Plugins Repository. Use custom widgets to grab content from external resources or present data from connected services in a unique format. Track, manage and analyze your projects and team activities more effectively with 18 different reports. The reports come in four different types: Issue Distribution, Timeline Reports, Time Management, and State Transition. Each type of report provides a unique slice of your projects and issues data. Share your reports with your team or the whole company. Clone any report to tweak it or create a similar one. 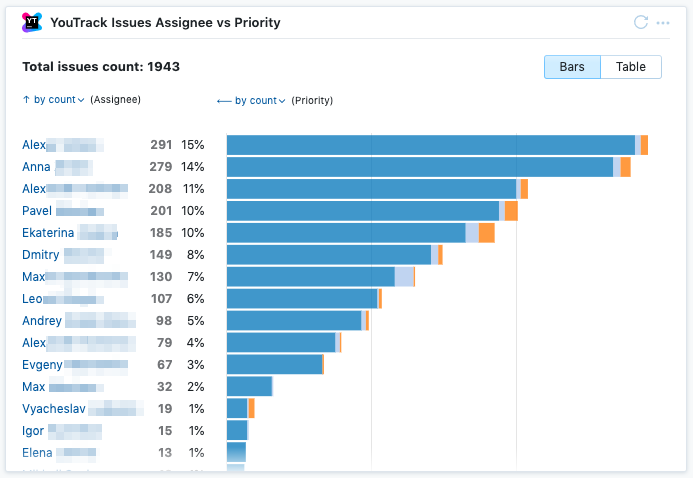 Use Issue Distribution reports to get an idea of how your issues are distributed by projects, assignees, priority, states and subsystems, fix versions and so on. 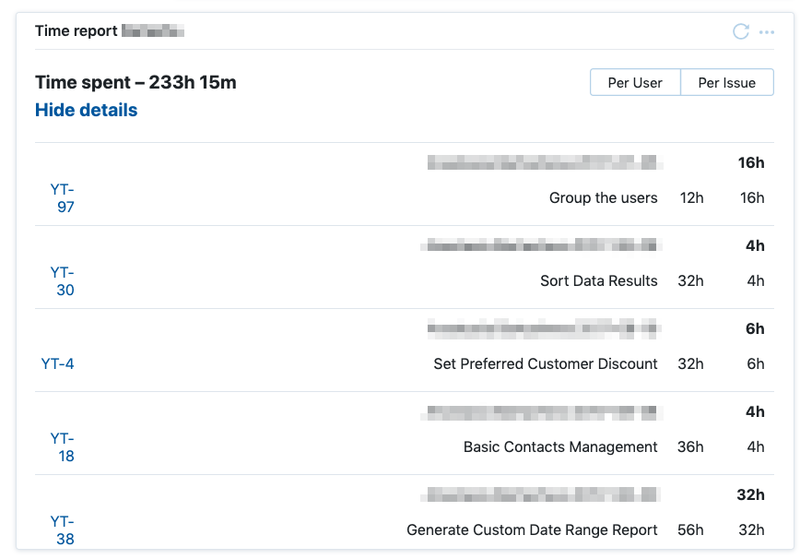 You can use predefined reports, like Issues per Assignee and Issues per project, or create advanced Issues per two fields report that allows you to choose any two fields, like Priority and Version, and see how your issues are distributed over these fields. Create Timeline reports to track dynamic changes in your projects and issues during a certain time period. Resolution time and Average issue age reports will help you track your progress over time. There are also Fixed vs Reported rate, Verified vs Reopened rate that help you analyse your development and testing team performance. Time report shows the total time your team spent on different activities during some iteration, and compares it with the original estimation. It can also include the types of work done, like development, testing, design etc. Time report can be either grouped by issues, users and projects. Track changes between particular states with State Transition reports. 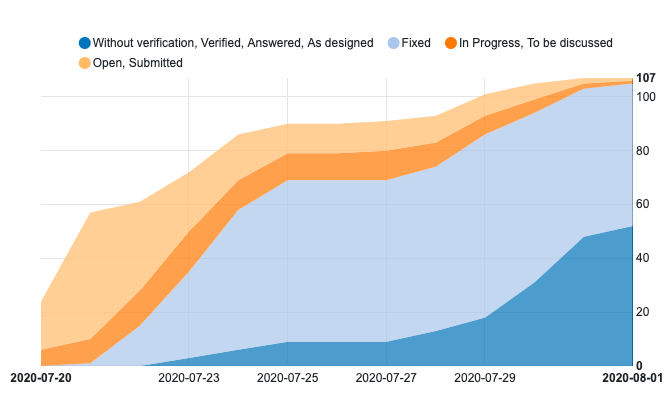 For example, you can create a report that shows how many issues have been Verified or Reopened this month, and see how many issues ended up as Can’t Reproduce. When you create a report, you can share is with your team, the whole company or make it visible to you only. 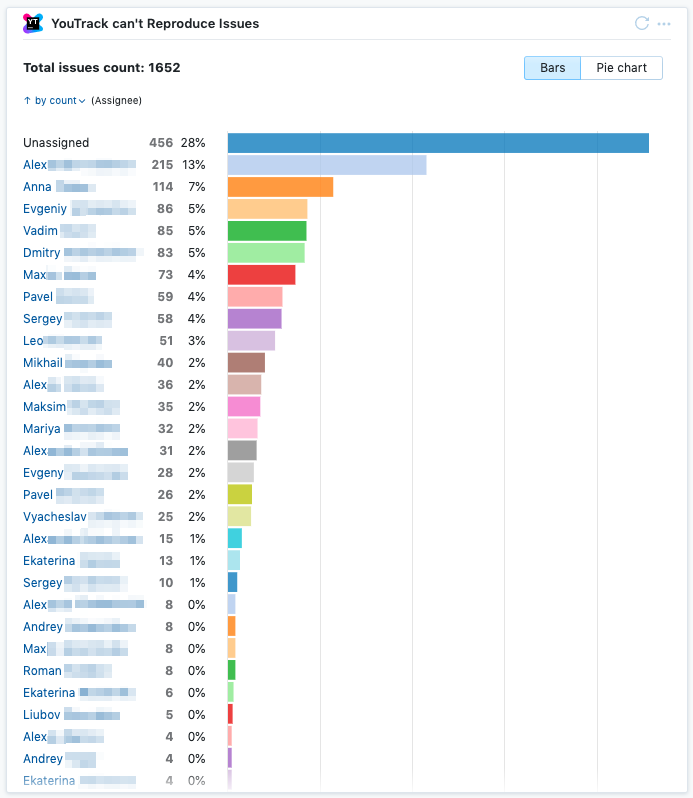 Shared reports are available from the Reports left panel, where every user may tune the list and decide which reports are shown and which are hidden from the list. Most of the reports are recalculated every 10 minutes automatically. However, for some Timeline and State transition reports you choose how often it needs to be recalculated. Of course, all the reports can be manually recalculated any time. When you need to create similar report, just clone the existing one. Download report in CSV format, if you want to play with its presentation or print it, when you need to share a paper copy.